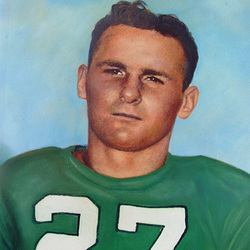 Two weeks before the first game of the 1945 University of Miami football season, Edward "Red" Cameron (just discharged from three years In the Navy) came back to finish his education at Miami. Red had lettered as a guard in 1941, but at 26 years of age, married and father of a son, his interest in football was at a low ebb. He told Coach Jack Harding "I don't know whether I can take it anymore. I'll be out of place with all those kids on the squad," but Harding talked him into returning. Red was not only the starting guard in the opening game, but went on to become Little All America first team. Miami's wins that year were over Florida, Clemson, North Carolina State, Michigan State, Auburn and Holy Cross. Cameron blocked three punts, recovered several fumbles, intercepted a pass and was among the team's leading tacklers and a deadly blocker. He really caught firs just before mid-season. The Hurricanes were trailing Miami of Ohio in the third quarter. Red was taken out for a breather and grasping for breath, he told Coach Harding: "We've got the fightingest bunch of kids in football, they'll win this game because they never know when they're licked." Seconds later, he was back on the field leading a furious rally which gave the Hurricanes a 27-13 win. 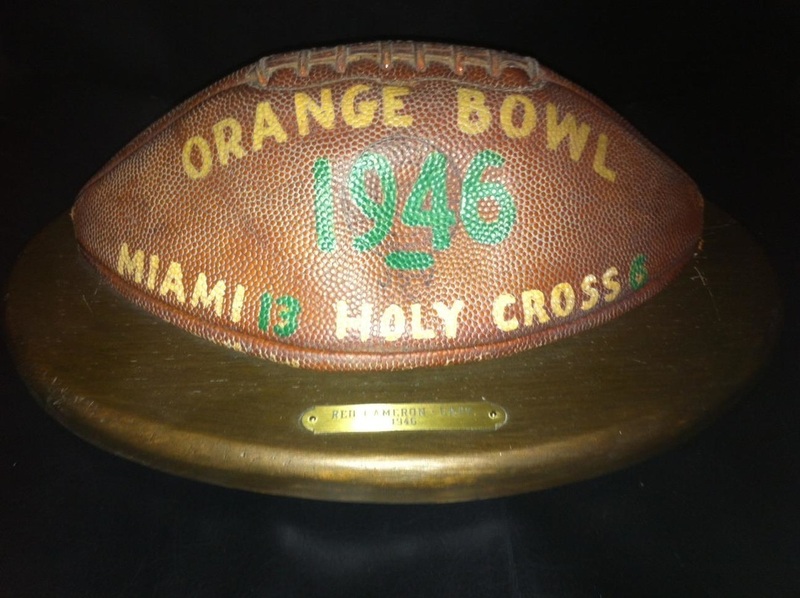 That Miami team of 1945 recived a bid to the annual New Year's Day Orange Bowl Classic and won what today is still regarded as one of the most dazzling wins in the history of Miami football--a triumph over Holy Cross after the final gun of the game went off. Cameron was one of the leaders of this dynamic Hurricane Orange Bowl team. Cameron played his school football for St. Benedict and Central in Newark, N.J. He came to Miami and lettered at guard in 1941 before entering the Navy. Cameron also lettered in boxing at Miami--fighting both as a light heavyweight and heavyweight. He had an excellent record, though he generally gave away considerable poundage. "Red" was never topped in courage, whether it was on the football field or in the ring. The UM Sports Hall of Fame is grateful to the Cameron family for donating a ball from the 1946 Orange Bowl game to the Hall of Fame, where it is currently on display next to a program and newspaper articles from the game.